Stop-motion animation is among the oldest of all animation styles. It’s a process wherein an object is moved millimeter by millimeter between photographed frames. So if film moves at 24 frames per second, it takes 24 photos to render one second of a stop-motion picture. Willis O’Brien used the method to bring his giant ape to life in 1933’s King Kong. Ray Harryhausen was the master of the process, however, animating classical tales of the gods in Clash of the Titans and Jason of the Argonauts. So much of my childhood belongs to Kong standing victorious over his dinosaur opponent, opening and shutting its jaw to confirm the kill, or to Jason’s battle with the skeletons, or to Perseus’ encounter with the snake-haired Medusa. 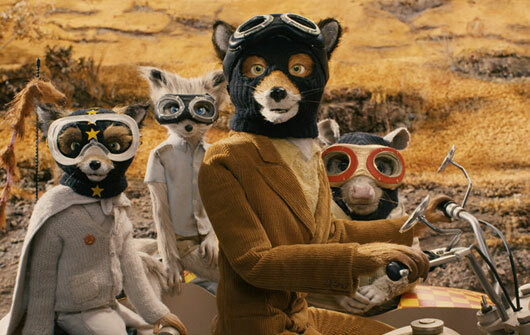 Wes Anderson’s Fantastic Mr. Fox adopts the stop-motion animation style for his latest film, a layered children’s entertainment that’s almost more fun for the adults in the audience than it is for the kids. Almost. His choice is bold, because in a time when computer animators can simply program a film into artistry, Anderson chose a raw, physical approach to suit his directorial style. And to be sure, Anderson’s personal flourishes, evident on everything between Bottle Rocket and The Darjeeling Limited, are alive and well here, despite his non-presence onset while the actual animators toiled away on completing his vision. 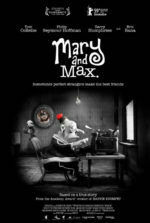 The story, based on the popular book by Roald Dahl, begins with Mr. and Mrs. Fox (voices of George Clooney and Meryl Streep) starting a family. The family moves up in the world to satisfy Mr. Fox’s ego, from a hole in the ground to an abode inside a nice tree. Since finding out his wife was pregnant, Mr. Fox has promised he will no longer take unnecessary risks. He stops stealing chickens in complicated, bravado plots and resolves to write a column that no one reads in the local newspaper. Meanwhile, their impetuous and “different” son Ash (voice of Jason Schwartzman) is jealous about his more talented cousin, Kristofferson (voice of Eric Anderson), moving in with them. But there’s fire burning in Mr. Fox. Their family’s house, for example, rests on a hill overlooking the farms of Boggis, Bunce, and Bean, three malicious human farmers whose respective chicken, turkey, and alcoholic cider factories are like the ultimate diamond score for a jewel thief. Mr. Fox begins sneaking out at night with his opossum friend, Kylie (voice of Wally Wolodarsky), to steal the farmers’ booty. This sends them into a rage; so they join forces and do everything in their power to dig out the pesky fox. Soon our woodland animal friends are banding together in the only safe place they can—deep under the ground—to stop the inhumane humans in a web of complicated schemes and risky master plans. The dialogue is fast and clever; as in all of Anderson’s work, the comic timing is brilliant. His voice actors lend these downy models immediate character with quick back-and-forths, dry humor, and sarcasm through rapid-fire discourse, as though we’re watching a screwball comedy. The animal models sport real hair. They look touchable. And whereas most of today’s stop-motion animators avoid that (because between each frame the loose individual hairs shift, creating an unnatural movement when the frames are spliced together), the choice here lends the picture unique stylistic disposition. Anderson’s approach is post-modern: vintage in its method, but creative and new in its application. It’s a joy to behold, both in terms of the nonstop laughter and appreciation of the picture as an artistic production three years in the making. While rated PG and completely safe for youngsters, those cussers Anderson and his co-writer Noah Baumbach have made one cuss of a good film, particularly for the adults. They’ve cut out any direct reference to naughty language and replaced with a clever substitute. This way, those little cussers in the audience won’t grasp that the filmmakers are pulling a fast one right before the eyes. Not only that, but the characters can speak like adults, inserting all the profanities they want without junior asking what a cuss cusser is after the show. All the adults in my screening laughed heartily as this went on, those cuss-for-brains kiddies none the wiser. Get what I’m saying? Every frame of the story tells you this is a Wes Anderson film. How rare for such a laborious medium! His choice of orangey autumn colors splashed with yellow and black lends a particular Thanksgiving feel, hence the release date one day before the noted holiday. The shot composition and speed of the action feels familiar, recalling shots from Anderson’s Rushmore and The Royal Tenenbaums. He imbues British rock as usual—how many children’s films do you know of with The Rolling Stones on the soundtrack? Just as Spike Jonze did with Where the Wild Things Are earlier this year, Anderson is reinventing a classic by his own rules, yet remaining faithful, if not enhancing the source material through his own artistic handprints. 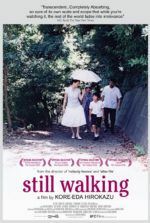 Even in the limited running time of just under 90-minutes, Anderson incorporates themes you’ll see in any of his pictures, including those ever-present daddy issues and the troubles of a big, complicated, colorful family. Strangely enough, the themes themselves are not muted for the sake of your children. 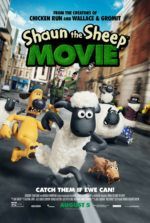 The experience is just as potent and emotionally resonant as ever; it just so happens that they’re being communicated through the guise of furry animal antics. 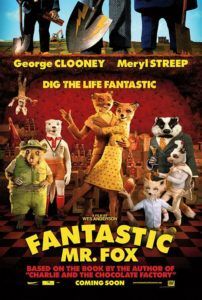 That Anderson made Fantastic Mr. Fox very obviously his film, both in the thematic and visual realms, in a medium comparatively out of the ordinary to his other works, speaks to his ability as an auteur. His hand-crafted little masterpiece is a delight in every sense of the word, and one of Anderson’s very best films.